ABOVE: Venetian summers can be hot, but hundreds of free water fountains make it easy for you and Fido (pronounced "Fee-do" in Italian) to keep hydrated. When should I visit (or avoid) Venice? Venice is popular with tourists year-round, but you're most likely to encounter crowds from May through October, during Carnival (usually in February), and at Christmas or Easter. Holiday weekends are also busy--and in good weather, any Saturday or Sunday is likely to attract daytrippers from the Italian mainland. Fortunately, you can avoid the worst of the crowds--even in peak season--by walking a few blocks inland from the Piazza San Marco, the Rialto Bridge, and other tourist magnets. In terms of weather, Venice has a fairly benign climate, although heat and humidity can be oppressive in the summer months. For month-by-month temperatures, rainfall, and other climate data, see the monthly weather averages in Metric and Imperial units at Weatherbase.com. If you're a fan of concerts, exhibitions, festivals, and other special events, check the local tourist office's events calendar. What's the "Lido di Venezia?" The Lido di Venezia is a long, narrow island that separates the Venetian Lagoon (where Venice's historic center is located) from the Adriatic Sea. In the summer, it's a resort island and the headquarters of the Venice Film Festival. The Lido is also a dormitory suburb for Venice, and--unlike the centro storico--it has modern streets with cars, buses, and bicycles. Staying on the Lido is worth considering at any time of year if you're flying in or out of Venice from Marco Polo Airport and want to save money on a hotel (see listings). If you're coming to Venice in the summer--and especially if you're traveling with children or simply enjoy sitting on the beach--you might want to consider spending a few days on the Lido. Many hotels have their own beach clubs, and the Lido also has public beaches. Speaking of children, is there anything for them to do in Venice? Sure. They can ride water buses, cross the Grand Canal by traghetto (gondola ferry), run around the many squares or campi, chase pigeons, watch boat traffic on the city's canals, and burn off steam at public playgrounds. Is Venice accessible to disabled travelers? Yes, but only to a degree. Inevitably, a city with more than 400 bridges (nearly all of which have steps) is going to present barriers to slow walkers and wheelchair users. And in a city where many buildings date to the 13th or 14th Century, stairs aren't always possible to avoid. Can I bring my bicycle to Venice? Yes, but you won't be able to ride it in the historic center. See our Venice Travel Blog post about bicycling in Venice (including where to park your bike). Can I bring my dog to Venice? Yes. 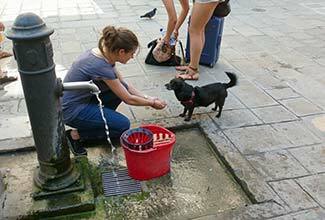 Venice is a dog-friendly city, and many hotels accept dogs by prior arrangement. (So do some, but not most, vacation apartments.) Just remember that public patches of grass are hard to find in Venice, so Fido and Fifi may have trouble figuring out where to do their business. Also remember to bring plastic bags for your canine companion's caca. You can deposit the filled bags in public trash containers, which are easy to find in busy walking streets and most campi or squares. For more about Venice from a dog lover's point of view, browse our Maggie in Venice blog.